The closest The UPS Store to Disney World and Disney Springs! Located near the intersection of I4 and State Road 535 one block northwest of Hotel Plaza Boulevard. Let us ship your luggage! Avoid lugging extra items in the airport dash and ship your luggage instead. The UPS Store is located minutes from Disney World hotels and we offer cost competitive options for luggage shipping. You can ship your items or suitcase in our luggage box or ship your luggage as is. Make your next trip to Orlando easier with luggage shipping options from The UPS Store at 12386 State Road 535. Meeting, Conference, Convention or Tradeshow? The UPS Store can help business travelers and meeting and event planners save time, while providing convenience and peace of mind. From last-minute print jobs, to pre-event preparation, we can help things run smoothly. Count on The UPS Store to coordinate all shipping and printing needs. Attract attention for every event and create a statement with professional banners and posters. Business travelers can send print files online to The UPS Store prior to arriving, and have print jobs produced and delivered to the meeting site. Event planners can count on The UPS Store to provide inbound and outbound shipping of event freight materials, and meeting attendees can ship luggage and souvenirs back home. Streamline meeting, conference, convention or tradeshow operations with help from The UPS Store. When you’re trying to make a lasting impression with printed materials, you want to consult with a local print expert. That’s where we come in. Stop by The UPS Store at 12386 State Road 535 to talk with a real person, someone that can help you design and print that perfect flyer, brochure, menu, invitation, banner or sign. We offer a variety of printed materials and are your local resource here in Orlando for all of your printing and copying needs. With shredding services available at The UPS Store located on 12386 State Road 535 in Orlando, you can get rid of your personal and business documents using one of the leading document destruction vendors, Iron Mountain®. Shred your items to help protect yourself and your business from identity theft. The UPS Store is your professional packing and shipping resource in Orlando. We offer a range of domestic, international and freight shipping services as well as custom shipping boxes, moving boxes and packing supplies. The UPS Store Certified Packing Experts at 12386 State Road 535 are here to help you ship with confidence. When you open a mailbox at The UPS Store, you get a lot more than just a box with a key. You'll get package acceptance from all shipping carriers, mail receipt notifications, and a real street address in 32836, not just a PO Box #. Apply today. Looking for a notary public in 32836? The UPS Store at 12386 State Road 535 offers convenient notary services near you. Stop by today to get your documents notarized and check another item off your to-do list. Our store at Lake Buena Vista is geographically the closest The UPS Store to Disney Springs and Disney World, located near the intersection of I4 and State Road 535 one block northwest of Hotel Plaza Boulevard. The store which opened for business in January of 2014 continues to excel and was honored for being in the top 10% in revenue growth in the network in Print Services and Shipping Services in 2018. The UPS Store in Orlando, FL is here to help individuals and small businesses by offering a wide range of products and services. We are locally owned and operated and conveniently located at 12386 State Road 535. While we're your local packing and shipping experts, we do much more. The UPS Store is your local print shop in 32836, providing professional printing services to market your small business or to help you complete your personal project or presentation. We offer secure mailbox and package acceptance services, document shredding, office and mailing supplies, faxing, scanning and more. Everything for your small business, even shipping. We've got you covered. 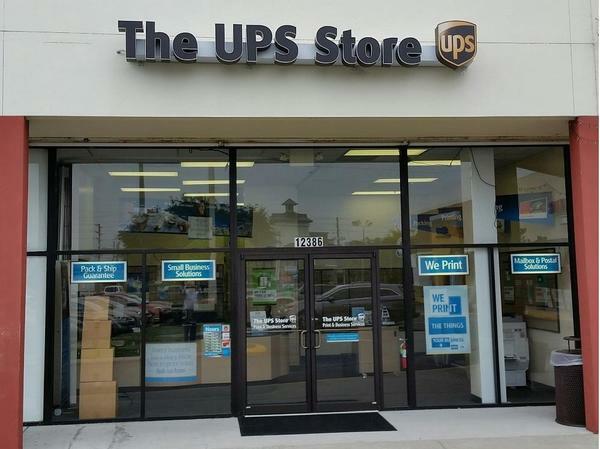 The UPS Store Lake Buena Vista in Orlando, FL offers the following products and services.